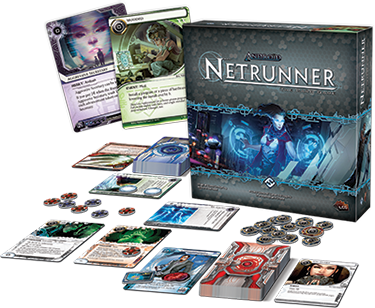 Android: Netrunner is an asymmetrical Living Card Game (LCG) for two players. The theme of the game is cyberpunk. Before the start of the game, the two players decides amongst themselves as to which role they will be utilising, the Corporation, or the Runner. For both the sides the winning condition would be to reach seven points. If you play as the Corporation, your goal would be to score agendas by advancing the agendas. The Corporation would need time and credits to advance this agendas to their desired state. To act as a layer of protection and time buying measure, the Corporation would need to install “Ice”. “Ice” is in simple terms a security program that the Corporation has in order to stop any attack from the Runners. As for the Runners, they need to spend time and credits to acquire a number of different resources, such as hardware and “Ice” breaking software. Runners are playing against the time, as the Corporation would be hard to stop once they have fully established their defences. To make up for it, Runners are given an extra click (action) every turn compared to the Corporation. When a runner attempts to attack the Corporation, they run a risk of losing their acquired wealth, like hardware and resources. Android: Netrunner is an extremely popular card game that is played by teens to adults. It’s easy to pick up and hard to master making it a perfect game for players to enjoy every time they play it. We run Android: Netrunner nights at our store on Tuesdays! Find out more here.